I re-read the dystopia 1984 in preparation for a talk I gave on language. I found those ideas so compelling that I forgot all about the main character’s love interest and the secret horror that proved to be his undoing. See below for what stood out in the novel when I re-read it. I didn’t care about the political and social aspects of the book, or even the personal struggles of the protagonist, nearly as much as the philosophical issues relating to knowledge and words, and from that standpoint, it’s an utterly fascinating book. Epistemology asks, How do we know what we know? Orwell asks, Can others take that knowledge away from us once we’ve got it? One of the ideas that interested me was that removing large quantities of words and imposing regularity across the language could make people stupider. The government in the world of 1984 promotes an increasingly simplified version of English called “Newspeak”. *I happen to really like the word doubleplusungood. Having seen it, I couldn’t unsee it. It’s a fixture in my mind now. If there were a way to get people to stop using words (which taking them out of the dictionary doesn’t really do), then I think people would in fact be stupider. We use different words to convey subtle shades of meaning. If we (somehow) lose the ability to convey subtle shades of meaning, then we will thus be less accurate in our own minds no less than in conversation or in writing. Another interesting idea is that language and thought are so closely tied together that removing words like “freedom” from circulation might actually prevent someone from having the undesirable thoughts associated with those words. I don’t buy it. When we haven’t got a word for something we observe in reality, we borrow or invent one, and we imagine stuff we haven’t got words for all the time. Language doesn’t drive reality; reality drives language. Or does it? In the world of 1984, the government destroys records that contradict current propaganda messages and rewrites them to agree. This process of continuous alteration was applied not only to newspapers, but to books, periodicals, pamphlets, posters, leaflets, films, sound-tracks, cartoons, photographs—to every kind of literature or documentation which might conceivably hold any political or ideological significance. Day by day and almost minute by minute the past was brought up to date…. All history was a palimpsest, scraped clean and reinscribed exactly as often as was necessary. The government is in control of all externally verifiable facts of the past; the only thing left is people’s all-too-malleable memories. It’s really hard to rely on your own memory if authoritative sources all disagree with you. Since the 1950s, psych studies have proven that people will falsify their own judgments of obvious differences in line length to agree with majority opinion. To say that people can be tricked is not the same as saying that propagandists actually create reality, though. The machines in The Matrix did a much more thorough job of tricking people, but they didn’t create reality either: they simulated it. Sadly, Orwell’s protagonist comes to believe that two plus two makes whatever Big Brother wants him to say it does at the moment. Maybe they are those that explicitly tell you what you already implicitly know but didn’t know you knew. I.e, they reveal unknown knowns. “Has it ever occurred to you,” he said, “that the whole history of English poetry has been determined by the fact that the English language lacks rhymes? Italian doesn’t, which determined the whole history of Italian poetry. [T]he choice for mankind lay between freedom and happiness, and… for the great bulk of mankind, happiness was better. Political pragmatism in a nutshell. Power should be used as a means. The trick is distinguishing between those who actually think so and those who only claim to. My paperback looks like this. It’s in a box somewhere, so I bought the e-book. I know I’ve read this book before, but it’s not in my records, so it must have been before 1999. 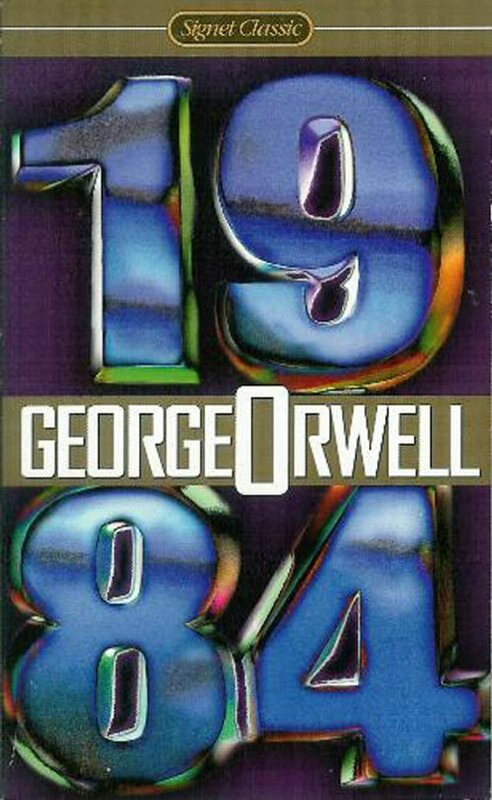 I wanted to re-read it because I wanted to examine the role of Newspeak in the dystopian society depicted by the book. Also, I just read another famous book by Orwell (Burmese Days). Earlier this year I read another famous dystopia (Brave New World).